Am 2. July 2012 wurde Bischof Gerhard Ludwig Müller zum Präfekten der Glaubenskongregation ernannt. Aber Bischof Müller ist ein Häretiker ! ER LEUGNET DIE REALPRÄSENZ ! Und er leugnet auch das Maria als Jungfrau Mutter von Jesus Christus geworden ist! Leugnet er die Transubstantiationslehre und die Realpräsenz ! Ich erkläre dass Bischof Müller deshalb automatisch EXKOMMINIZIERT ist ! Damit führt Bischof Müller alle Ämter illegal aus ! Since 2 July 2012 Bishop Gerhard Ludwig Müller (from Germany) is the new prefect of the Congregation for the Doctrine of the Faith. This german bishop is very well known for his heresy ! He denied the sacrament of the Holy Eucharist ! He denied that Mary was a virgin when became mother of Jesus! He refused to obey the pope many years to correct the words ! 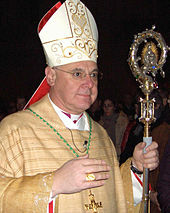 Normaly Bishop Müller would have been a target of an intervention of the Congregation for the Doctrine of the Faith because he is an heretic. But now he is the head of this congregation ! And ofcourse we can not expect that he is acting against himself or against all the other bishops that are spreading heresy. I declare: Because of his heresy Bishop Müller is excommunicated (excommunicatio latae sententiae) and acting illegaly in his office ! I declare: Because of his heresy Bishop Zollitsch is excommunicated (excommunicatio latae sententiae) and acting illegaly in his office ! The german Bishop Zollitsch did teach publicaly the HERESY that Jesus Christ did not die at the cross for the forgiving of the sins ! I declare: Because of his heresy Bishop Ackermann is excommunicated (excommunicatio latae sententiae) and acting illegaly in his office ! 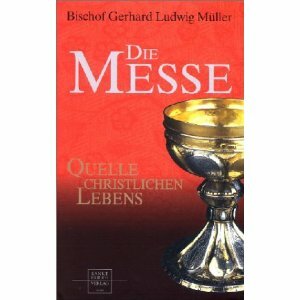 The german Bishop Ackermann did teach publicaly the HERESY that the real pentecost miracles did not happen !